Can I Request You Use My Organic Cleaning Products? Certainly we can clean with whatever products you choose to use in your house hold. However, House Cleaning Melbourne has researched and selected a full range of organic products we feel are superior to many on the market. It is possible to clean most everything in a home with simple vinegar, baking soda and steam, and our company has done that. Those methods generally are sufficient for homes that are cleaned daily or at least weekly. In homes where cleaning has been deferred for a long period, we may suggest to a homeowners or landlords that prefer organic products that we use Eco-friendly cleaning products instead. Eco-friendly products will sill have a low impact on the environment, but are not necessarily organic. 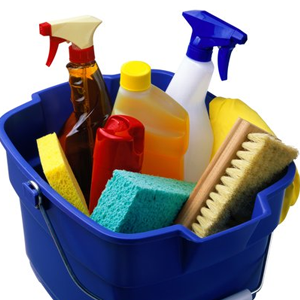 We quote for cleaning services includes a discussion about the cleaning supplies. House Cleaning Melbourne is sympathetic toward people who have allergies, asthma, or compromised immune systems. Furthermore, we respect your values and help you evaluate and select the organic cleaning products available that are right for you. *Costs vary according to number of baths, number of windows and overall square footage. The basic cleaning package is eligible for telephone quotes. House Cleaning Melbourne is a full service cleaning company offering a wide scope of specific types of cleaning, including organic cleaning, Eco-friendly cleaning, green cleaning and natural cleaning. There are very subtle differences between these categories of cleaning. Organic cleaning is using only organically derived cleaning solutions and products, meaning they must derived from living organic matter. Vinegar, and orange oil would be products in the Organic category because vinegar is created from fermentation plant material and orange or lemon oil comes from citrus fruit. Contrarily, borax, salt and baking soda, while considered natural cleaning and green cleaning agents, are not organic cleaning agents. That is, they are derived from a mineral. Like rocks minerals are considered inorganic. All of these cleaning agents are considered Eco-friendly cleaning agents because they do not have a negative impact on the environment. Understanding the differences may help you decide what the best alternative cleaning agent is for you, your family, your values and your budget. House Cleaning Melbourne is a locally owned and operated professional cleaning company servicing businesses and individuals in the greater Melbourne area for over 25 years. We gained our reputation in the area of being the best, by performing commercial cleaning for businesses that must abide by myriad, strictly enforced, federal Department of Health and state regulations. While House Cleaning Melbourne started as primarily a commercial contractor, we feel the homeowners and renters can greatly benefit from our knowledge, techniques and skill gained working in the business sector. If you want organic cleaning, natural cleaning, Eco-friendly cleaning or green cleaning, you don’t have to do it alone.